When I first loaded up the The Sims 3 on the Nintendo 3DS, I immediately experimented with new and creative ways to kill my Sim. After it did the equivalent of putting the lotion on its skin or getting the hose again, his walls became a tomb, and the Sim died slowly. It is horrible of me, and I am somewhat ashamed to admit my glee at the multiple ways I found in killing my poor, doomed Sim, but I was impressed at the several godlike abilities that the game offered. And then looked around and realized that I had spent several hours engrossed in this game. The Sims is what it is. Some obsessively enjoy the simulation, and entire worlds crop up around the simulated world created by the users. Others cannot stand the fact that your video game character actually has to use the bathroom and think the whole thing is a massive waste of time. 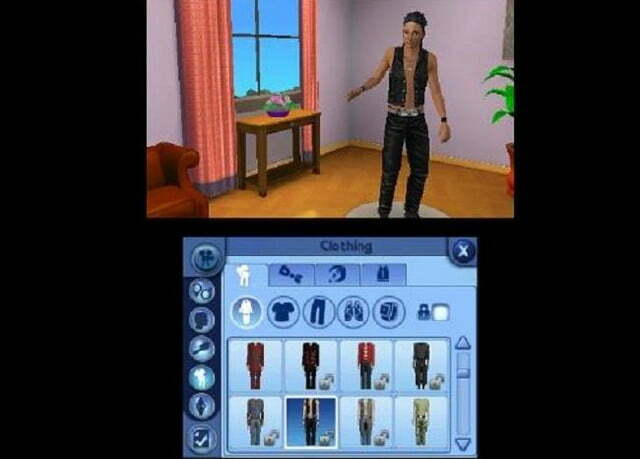 The Sims 3 on the 3DS has an odd issue because of that. The game does not offer anything new enough to convert people to the genre if they already dislike it, while fans are going to have a hard time sacrificing some of the features that they have grown accustomed to on computer, console and even smartphone versions of the game. The graphics are also an issue, and they are actually a step back for the series, even in terms of handheld versions. That is actually an issue for the gameplay too, as the poor graphics make it sometimes difficult to identify what is going on in your Sim’s world, and you need to zoom in to see certain things which in turn limits the overall field of view. But if you can look past the graphics, The Sims 3 offers a fairly decent port of the game. It may not be enough for longtime fans, but it does do a fairly good job with the controls of the 3DS. You can do most of the things that the PC will allow, at least enough that there are plenty of things to keep you occupied. There are obvious limitations compared to the much more robust versions already out, but there are enough things to entertain you, if you are a fan–or maybe entertain is the wrong word. This game can definitely offer a lengthy and time consuming distraction if nothing else. It is fun to take the Sims with you, but the 3D is fairly pointless to begin with, and mixed with the poor graphics it is likely that most will just turn the 3D down in order to save the battery on the 3DS. More than that though, the 3D is actually somewhat flawed at times, and there are several instances where you will see dual images. It is rare, but it is painful on your eyes. The 3D aside, the game is what you would expect from a Sims title, and little inclusions like the ability to connect to other Nintendo 3DS systems you come into contact with, even if both systems are turned off, are a good touch. You can trade content, including clothes and things like that, and while it is something that won’t alter the overall gameplay, but it keeps things ever changing and the world continually growing. The Sims 3 is a decent port of the console and PC version of the same game, but it is trying to fill a niche that may not be there to fill. That being said, the 3DS version does an admirable job of taking a complex game and converting it to the much more simplified controls of the handheld systems. The graphics suffer, but in general it is a solid port for fans. It won’t win over the haters, but it could offer door to new fans that want to try the series out. Longtime fans of the series will probably choose to stick to the more sophisticated versions though.